Jeremy Bottau at Gaspard Yachts tells me he's now taken over the central agency for sale of the 36.5m motor yacht Firouzeh and she's had a €500,000 price cut. Delivered by ISA in 2007, this superyacht has had only one owner and has been immaculately maintained. There is spacious accommodation for up to 12 guests in a main deck master suite, two double and two twin staterooms plus Pullman berths. Deck spaces are extensive, including a flybridge with large dining area, Jacuzzi and bar. 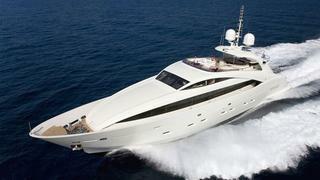 Available to view at the Monaco Yacht Show, Firouzeh is now asking €7.4 million and offers are welcome.